Welcome to you all, on behalf of the Committee and myself, we hope you have an enjoyable day. We hope we have provided something for the whole family – food, education, fun, demonstrations, music and lots of varied stalls. Please feel free to bring any comments to our information center in West Street. We really do value your comments. So please take your time, have a great day and thanks for coming. On Sunday 19th May 2019, this nationally acclaimed annual festival will attract thousands of visitors to New Alresford in Hampshire. They come to celebrate watercress - the superb locally grown, delicious and versatile crop. Every year, on the third Sunday of May, we see this beautiful market town become the site of a huge street festival. Over 100 stalls showcase the very best local food and drink producers. Others sell arts, crafts, jewellery and clothing, items for house, garden and much else besides. OUR PARTNERS On the day of the festival, over 100 volunteers from local sports clubs and voluntary organisations manage the car parks, man traffic barriers, assist the market set-up and ensure the site is neat, tidy and litter-free. 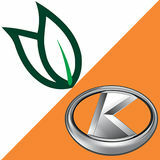 They aid many of the thousands of visitors and perform numerous other tasks. Their efforts ensure that the festival continues to feature as an important event in the town’s calendar. The festival’s income is generated from stallholder fees, car parking charges, sponsorships and after costs, donations in the region of £14K are made to many local sports clubs and voluntary organisations as our way of thanking them for their invaluable support. At 10.00 a large cavalcade of musicians, dancers and children accompany the Watercress King and Queen up Broad Street as they distribute freshly cut bunches of watercress to festival goers. Throughout the day, musicians and street performers entertain on the main stage, in St. John’s Church and on the streets. For the young, there are circus skills workshops, face painting, Punch & Judy shows, petting farm and much more. Well-known chefs will demonstrate delicious watercress-inspired dishes and more adventurous visitors can take up the challenge of the World Watercress Eating Championships. Broad Street becomes home to over 40 producers from Hampshire Farmers Market along many independent traders with local produces for you to taste, try and buy including including free range beef, lamb, pork and chicken, rare breed meat, fresh fish, cheeses, wines, etc. In addition, there will be many others showcasing Alresford’s restaurants, butchers, tearooms, cafés, wine merchants, milkshake bar, local brewery and some traders from Alresford’s own Thursday Market. The festival has a dedicated Kids’ Zone in East Street where Juggling Jake* offers circus skills workshops throughout the day with a circus skills shows. We welcome back Ticklish Allsorts* and his amazing Punch & Judy show. The ‘theatre’ will be set up in East Street. The shows will be running hourly. there is a ‘magic’ roundabout at the top of Broad Street for younger visitors. Kidsrome bring the countryside to town with their children’s petting farm designed to give young and old a rare opportunity to get up close to farm animals including a donkey, goats, sheep, rabbits and chickens. The Alresford & Cheriton Scouts’ Spider Mountain presents a challenge. Take a short walk along East Street to the AWF car park (opposite Long Barn) to watch the free falconry displays throughout the day by the Falconhigh Display Team. *see page 13 for show times. Finally, just in case your youngsters go walk-about, collect a child’s wristband from the Festival Information Centre in West Street. The information could help us reunite you more easily. It also gives your child a chance to see where to go in case he/she gets lost. Alternatively please write your mobile number on your childs arm to assist us. Alongside the food and drink offerings to be found in Broad Street, Station Road and West Street become home for the day to our own Festival Market featuring stalls offering arts, crafts, jewellery, clothing, items for the home and garden and much more. Local Charities and voluntary organisations are on hand to provide an insight into Alresfordâ&#x20AC;&#x2122;s rich and eclectic community life. Many of Alresfords independent businesses will be open throughout the festival, so why not take this opportunity to wander around and see whatâ&#x20AC;&#x2122;s on offer in this unique town. Beautiful, lush, green beds fed by cool, mineral-rich spring water; watercress production is a unique and fascinating process attracts an abundance of wildlife and not just the ones that love to feed of its nutrient rich leaves but the crawly kind too! Watercress farms are operational all year round and uniquely grow on a monocropping system cropped between 4-6 times per year making it a truly unique environment. As a result the beds are a hive of activity with over 40 species of insects and wildlife living in or surrounding the beds. Visit our watercress environmental zone (No9 on the map) to learn more about the production of this super salad, look up close at the insects that live in the beds and the ways growers support and encourage wildlife in the area. HISTORY OF WATERCRESS There are many ways you can experience the history of watercress at the festival; look out for the wicker flat baskets and veneer chips used to transport to market, the horse and cart that would meet the railway to then make its journey to London and by visiting our ‘history zone’ located near Alresford station (No 10 on the map). Here you can meet our experts and learn more about the history of watercress, its rapid expansion and the essential production during both World Wars to keep Britain fighting fit. History Well known for its health benefits by the ancient Greeks and Romans, Watercress has a long and well-loved history in the UK and not least in Alresford, Hampshire. When it all started… For thousands of year watercress was harvested locally from streams or small beds fed by spring water. By the mid1800s watercress could be found in farms scattered throughout the UK. With the advent of the railway network in the Victorian era the route to markets throughout the country became much easier and watercress hotspots emerged in ideal locations, focussing production in sites with abundant, mineral rich and clean water. Alresford, with its perfect growing conditions and newly built train station, prospered and the area became so famous for its relationship with this green superhero that it became known as the ‘Watercress Capital of the World’! will operate from the bottom of Station Hill, Ropley, between 09:30 and 16:00. This car park is accessible for guests arriving from Guildford/Alton, Winchester via the by-pass or Petersfield and will be signed posted on the A31. ARRIVING BY TRAIN Trains operate from London to both Winchester and Alton. Bus connections are possible from both to Alresford. Due to works there is no connection at Alton to MHR “The Watercress Line” to Alresford. MHR will operate from Medsted and Ropley to Alresford only. TIMING & EVENTS The festival opens at 10:00 with the cavalcade along Broad Street. The Watercress King and Queen, accompanied by children from Sun Hill Infant and Junior School, will distribute the first of the seasons watercress harvest to festival goers. Sussex Jazz Kings, Hook Eagles Morris and Mayflower Morris will accompany the horse and cart on its way. Throughout the day music, song and dance will take place on the main stage, in St Johns Church and in the streets. Alresford Ukele Jam will busk their way around the town and from 11:30 to 12:30 part of Godalming Brass will perform at the bottom of West Street. All timings were correct at the time of print, but may change during the festival. 10 WAYS WITH WATERCRESS Whether you just like munching it raw or want to try another dish to impress your friends and family we can help you find a great way to use the nutrient rich watercress throughout your day. Post us your results on Instagram using #WatercressChallenge Soup Lady, Di, Raymond Blanc and Liz Hurley all swear by the iconic watercress soup. Sandwich/wraps It’s a brilliant addition to any sandwich – Mary Berry does watercress with jam. Sauce Sauces are easy to make with watercress and work really well with fish and chicken. Salads Pairs well with pomegranates, citrus and balsamic vinegar. Watercress and date power balls Are brilliant if you’re looking for an energy boost before training. Smoothies Move over kale as watercress is a much better ingredient for smoothies as it’s not got the fibres. Pesto Add with spinach and create a new pesto that’s popular with children. Risotto Partners up with mushroom in creamy risotto. Stir-frys Watercress is a brassica and works really well in stir-fried rice or noodles. Dips Blend with crème fresh/cream cheese for a delicious watercress drop for parties. Preheat the oven to 200°C, then chop the sweet potatoes into inch cubes with the skin on. Place into a roasting tray, season with salt and pepper, drizzle with olive oil and roast in the oven for 15-20 minutes. Cook the quinoa in salted boiling water according the packet instructions. Place the broccoli into a metal colander and set over the boiling quinoa. Cover and steam the broccoli for three minutes. Once cooked, drain and rinse the quinoa and broccoli under cold running water. Remove the sweet potato from the oven. Cut the pomegranate in half and squeeze the juice from one half into a large bowl. Add the olive oil, chilli flakes and lime juice, whisk together and season to taste. Add in the coriander, alfalfa, quinoa and sweet potato and toss well. Peel the avocado, remove the stone and roughly chop. Spread the quinoa and sweet potato mixture onto a serving plate and dot the avocado over the top. Finally, bash the second half of the pomegranate with a wooden spoon to knock the seeds out and scatter these over the plate along with the toasted nuts. Serve with the pomegranate and chilli dressing drizzled over the top. 80-100g of watercress 1 glass of pineapple juice, 6 ice cubes and 1 apple and small handful of spinach leaves serves 2-3. Add to blender and Blitz for 30 seconds until smooth – serve and enjoy immediately for max nutrient hit! ANDI Food Scores: Rating the Nutrient Density of Foods. The Aggregate Nutrient Density Index (ANDI) ranks the nutrient value of many common foods on the basis of how many nutrients they deliver to your body for each calorie consumed. Inlike food labels which list only a few nutrients, ANDI scores are based on thirty-four important nutritional parameters. Foods are ranked on a scale of 1-1000, with the most nutritious leafy green vegetable being watercress scoring 1000. Win a Broil King BBQ worth over £1000 To enter simply head to the @WatercressFestival Facebook Page and click onto the competition post for “Win a Broil King BBQ” and follow the instructions. Winner will be drawn from entries on the 18th May. 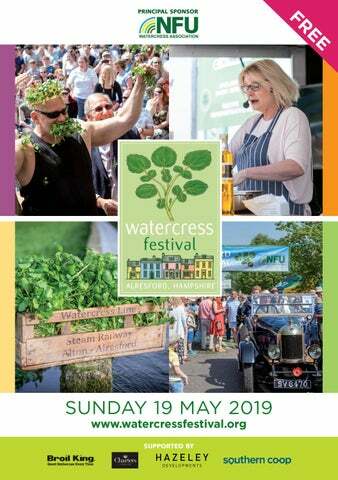 Watercress Festival Awards WIN kudos, a hamper, a title and a year’s worth of free watercress deliveries by adding a new watercress dish to your restaurant, café or product list. Awarded to the most mind blowingly awesome use of watercress in a recipe, upload photos of your entry via social media using #watercresschallenge and register a sample of the product with the festival committee via www.watercressfestival.org. The winner will be announced on the main stage after the watercress eating championship. Win a year’s supply of watercress over 12 monthly deliveries, worth over £150 To enter simply head to the @WatercressFestival Facebook Page and click onto the competition post for ‘Win a Year’s Watercress’ and follow the instructions. Winner will be drawn from entries on the 18th May. Annual World Watercress Eating Championships Test your watercress chomping abilities against some of the world’s fastest watercress eaters, working their way through 1 x 85g bag. Register at the main stage at 2.30 and the competition starts at 3.00. Can you take the heat and beat 32 seconds to win the coveted Alresford Watercress Festival Record? We are delighted to be supporting our principle charity Joe Glover Trust – Children’s Cancer Charity again this year adding to our total so far of over £20,000 in the last 6 years. Come along for as many bags of watercress as you like for a donation and help us make a huge difference to the families supported by this fantastic local charity. Find us at the watercress give away/ charity collection points at the Science & Health Zone (Map No: 11) & top of Broad St near the (i) Information stand. Brand new two bedroom apartments with allocated parking in the heart of Alresford. Minutes from excellent specialist shops and boutiques. Contact Charters for further information on 01962 734 633.